LONDON — Grief turned to anger over the London high-rise fire Friday as focus shifted onto outdated regulations dating back decades and government funding cuts that may have contributed to the disaster that killed at least 30. Dozens of protesters stormed the offices of the local government that owns the burned-out building Friday afternoon calling for justice for the victims of the blaze. 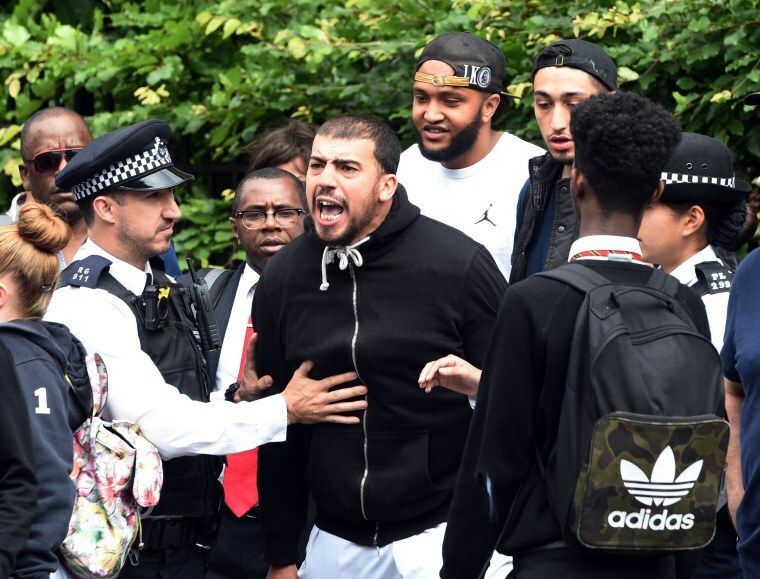 Relatives and survivors also expressed outrage at Prime Minister Theresa May, who visited the smoldering remains of Grenfell Tower without meeting with local residents, citing security concerns. There was also growing concern that up to 4,000 similar public housing blocks across Britain — where sprinkler systems are not mandatory on older buildings — are at risk of similar tragedies. And while authorities wouldn’t speculate on what caused Wednesday morning’s fire to spread so rapidly, the focus remained on recent renovations that added a flammable exterior. More protests were planned in London Friday and on Saturday amid dismay that residents in Grenfell Tower warned of safety concerns but were ignored. There was also anger that two similar deadly fires prompted demands for new safety rules, but the government had not implemented recommendations in their wake. Britain’s long tradition of brick or concrete construction has spawned a different approach to fire regulations in comparison to the United States, where timber frame construction is more common, experts told NBC News. All new buildings must have sprinklers by law but older ones such as Grenfell Tower, owned by the local government since its construction in 1974, are not required to have them installed. An $11 million refurbishment completed last year upgraded heating and water systems for residents and added exterior cladding to improve thermal insulation and the tower’s drab appearance. Grenfell Tower’s original concrete structure was expected to confine any fires to individual floors, giving residents time to await fire crews or escape. Huge chunks of the aluminium composite material (ACM) blistered and peeled off the tower during Wednesday’s inferno, showering survivors and rescue workers in acrid ash that covered a radius of several blocks. There was no requirement to use a fire-resistant version. The Guardian newspaper reported Friday that the supplier, Omnis Exteriors, had been asked to provide non fire-resistant cladding that was 25 cents per square foot cheaper. The report could not be confirmed by NBC News. Non fire-resistant ACM is banned in the U.S. for buildings taller than 40 feet, manufacturer Reynobond told The Times newspaper. The evacuation plan, which called for residents to “stay put” with damp towels under their doors and await emergency crews, might have been reviewed in the wake of a similar disaster. An inquiry into the deaths of six residents at Lakanal House in south London in 2009 found residents were trapped in their homes as exterior cladding panels burned up in a matter of minutes. The coroner concluded that building regulations were not up to scratch, but government ministers failed to make mandatory changes, according to the lawyer who represented some of the victims. A year later, another coroner investigating the deaths of two firefighters at a tower block in Southampton, England, recommended sprinklers be fitted to all high-rise buildings of more than 50 feet — but again, there was no change in the law. “In the U.S., sprinklers are much more widespread and there are serious questions to be asked here about why sprinklers were not included in the recent renovation at Grenfell Tower,” said Glockling. Public anger was also focused on austerity cuts to fire services. Since 2010, central government funding to fire and rescue services has been cut by more than one-third, according to the Fire Brigades Union. In London the number of firefighters has been cut by almost one-fifth over the same period, it said. That comes alongside a rise in the number of fire-related deaths. Official figures show that 303 people died in fires in England during 2015 and 2016, up 15 percent on the previous year. Response times to all types of serious fires also rose. "There has been a record number of fire station closures and fire engines being cut. So that means people are left running the service on a shoestring," said Matt Wrack, the FBU’s general secretary. The Chief Fire Officers Association said those cuts came on top of government spending cuts of 22 percent imposed on local services in 2010 following the global financial collapse. Residents at Grenfell Tower had also complained about a number of other possible fire hazards in the months leading up to the fire. There were worries about exposed gas pipes in recent weeks, as well as concerns about garbage posing a fire risk and the placement of boilers and heaters. In north London, residents of Burnham House, owned by Camden Council, said they feared a similar disaster because, like Grenfell Tower, their building lacked a single central fire alarm system. “There is no alarm, unless you go banging on people’s doors,” Bob O’Toole of the building’s tenants’ association said. Jeremy Corbyn, leader of England’s opposition Labour Party, said the fear generated by the blaze would be felt far beyond Grenfell Tower.